Yes, it’s been quite a while since my last post. That’s because 1) New Zealand’s wifi connections are few and far between, and 2) I’ve been walking and hitching my way through south New Zealand for the last 8 days. Day 0: Meet up with my long lost friend Renee and her buddy Mikey and introduce them to my new friends Will and Ryan in the DOC parking lot in tiny Glenorchy. Instant tribe. Day 1: Leave car in the Greenstone/Caples carpark and set out with Ryan, Renee, and Mikey on the Greenstone track for the Greenstone hut. Day 2: After a leisurely start and several snack and riverside coffee stops later, roll into the McKeller hut with all elderly crowd (#easytrack). Day 3: Hike out towards the Divide, and drop the packs for a jaw-dropping side trip to Key Summit. Hitchhike down from the Divide to the tiny town of Te Anau, where we consume our weight in New Zealand pies and forlornly search for a room in a town inexplicably overrun by Chinese New Year. Sadly pitch tents on the holiday park lawn and go shopping while hungry for food for the 3-day Kepler track (#badidea). Day 4: Renee and Mikey are hiking Kepler the opposite direction due to booking fiascos, so Ryan and I spend 45 minutes trying to hitch a ride to the Rainbow Reach trailhead parking lot. Ryan hides behind a pole while I stick my thumb out and a car promptly stops. We hike through magical beach forest to the sandfly hell that is the Iris Burn campsite, pitch the tent, and huddle in it while killing the stray sandfly that got past the zipper. Day 5: Breathtaking. Incredible. Hours of hiking above the clouds with a sea of high peaks. We run into Renee and Mikey halfway and have a joyful reunion before tearfully leaving them to hike in opposite directions. We make it to Brod Bay and fall in the lake. Debate hiking the hour and a half into town for beer. 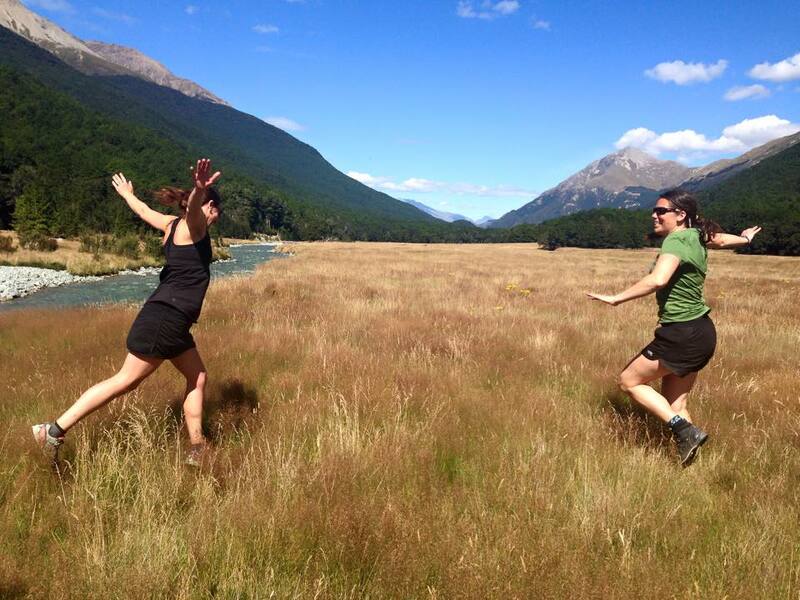 Day 6: Hike the hour and a half into Te Anau and eat our weight in pies. We actually got a room this time, but linens cost $9/each, so we sleep in our sleeping bags anyway (#lowbagger). Day 7: Hitch back up to the Divide, where the miles of backpacking catch up to us. Mikey falls apart at the top of McKeller Saddle. We assume he’s hiking behind because he wants alone time and offer no support (#badfriends). We spot our friend Will the hut warden fly fishing in the most beautiful meadow ever and spend some time frolicking. We get totally sandbagged seeing him and our bodies shut down well before reaching the Caples hut, which reveals itself 3 times over ridges without getting any closer, like a bad optical illusion. It was all worth it though. We meet our new tribe members Ellyse and John Michael at the Caples hut, and are joined by the other hut warden Ben for an epic evening involving 2 liters of wine between 8 people (#doweknowhowtopartyorwhat). Day 8: Leisurely morning of coffee, pancakes, and magical swimming holes before hiking out all together back to the lonely cars at the Greenstone/Caples carpark. My car actually starts (#win). Thank god for rest days involving ice cream cookie sandwiches, awkward photo shoots, and a new tribe of friends. Oh my gosh – I can visualize your adventures and love the humor along with the “feel-like-I’m-there” descriptions. Really enjoyed reading it!